Scottish singer/songwriter Eilidh McKellar will be releasing her debut full length Delta Devil Dreams later in the year, but has revealed her first single “Summer Daze” which can be viewed below. McKellar will be touring the UK beginning on March 26th, and will have a new video for the song “Hold Steady” in February. See below for full details. In the UK, where the reverence for American blues artists runs deep and brings forth legendary guitar heroes such as Jeff Beck and Eric Clapton, the endless grey skies of Edinburgh, Scotland are most definitely not immune to this musical iconography. Eilidh McKellar, a 20-year-old Scottish born singer and guitarist offers an interesting blend of indie rock, blues, and pop music with a nod toward the new world. In October 2013, her debut track and video Summer Daze premiered exclusively through Guitar World. Guitar World says, “McKellar serves up an interesting blend of indie rock and pop with a nod toward British and American blues.” The track is just a sample of her beautiful forthcoming debut album Delta Devil Dreams. Delta Devil Dreams, produced by Guy Eckstine, features McKellar baring her soul; rocking her guitar with heartfelt emotion in her musical comfort zone with swaggering rock-based riffs and rich vocals. It’s as if Jack White and Amy Winehouse took a road trip down Highway 61 and picked up a hitchhiking Stevie Ray Vaughan. A highlight of Eilidh’s burgeoning career was her incredible performance at the Hammersmith Apollo with legendary blues/rock guitarist, Joe Bonamassa. Bonamassa discovered Eilidh on YouTube and asked her to join him on stage for a special performance. Delighted, she took him up on the honor while stunning the audience, and Joe himself, with her powerful and passionate solos. 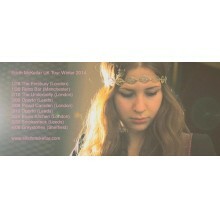 Eilidh kicks off a UK tour this month to promote the release of Delta Devil Dreams.